Rivals in Rio follows the athletes throughout the games in Rio viewed from a college sports perspective. See how your college ranks and read about daily rivalries right here. Rivals in Rio includes only schools that participate in the Nissan College 100 program. Silver medalist Will Claye (left)) and gold medalist Christian Taylor of the United States pose after the men's triple jump final on Day 11 of the Rio 2016 Olympic Games at the Olympic Stadium on August 16, 2016 in Rio de Janeiro, Brazil. In the end, Doris could not fell the Goliaths. Former University of Florida star Christian Taylor won his second consecutive gold medal in the triple jump on Tuesday, while fellow Gator Will Claye leaped to his second straight silver. Iowa's Troy Doris finished seventh. Taylor's jump of 17.86 meters (58.60 feet) edged Claye's 17.76 meters (58.27 feet) as the two Florida standouts repeated the one-two finish they posted in London's 2012 Olympics. Doris's longest leap, 16.90 meters (55.45 feet), left him in the middle of the pack. In 2012 in London, Taylor took home the gold with a jump of 17.81 meters (58.43 feet), while Claye’s jump of 17.62 meters (57.81 feet) earned him the silver. Claye also won a bronze medal in London with a long jump of 8.12 meters (26.64 feet), making him the first man since 1936 to medal in those two events in the same Olympics. Claye will not have a chance to repeat his double, as he did not qualify for the long jump in Rio. Taylor topped Monday’s qualifying round with a jump of 17.24 meters (56.56 feet), while Claye’s 17.05 meters (55.94 feet) was good for third and Doris’s 16.81 meters (55.15 feet) made him sixth-best. In three years as a Gator, Taylor earned 10 All-American nods, including the 2009 Indoor triple jump NCAA National Championship and the 2010 Indoor and Outdoor NCAA titles. Claye began his career at the University of Oklahoma, where he won the 2009 NCAA Outdoor triple jump National Championship before making the move to the University of Florida with head coach Jeremy Fischer. As a Gator — and a teammate of Taylor’s — Claye set a NCAA Indoor Championship record with a leap of 56 feet 10 inches. 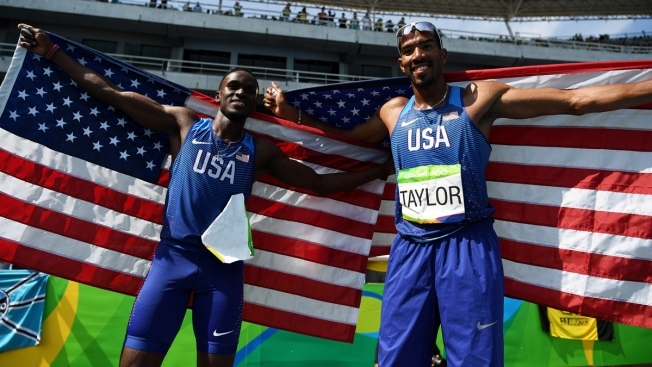 Claye credits his relationship with Taylor for some of their shared success. “It’s like a brotherly rivalry,” Claye told the Gainesville Sun. “We’ve been going back and forth since high school. And that’s been one of the major pushes for the both of us. 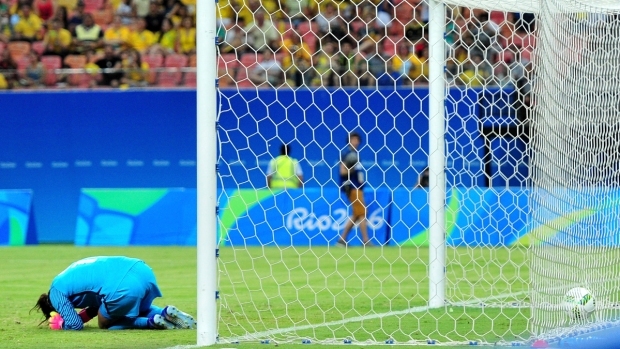 We always want to one-up each other so that definitely comes into play and motivates us." Doris, who at 27 is older than both Taylor and Claye, owes his first Olympic berth to a change in nationality. In 2015, Doris became a Guyanese citizen despite never having stepped foot in the South American nation that was the birthplace of his parents. He grew up in the suburbs of Chicago. "Gaining citizenship in Guyana provided a better opportunity for me as a track athlete," Doris told hawkeyesports.com. "With the potential I have, it gives me a chance to compete in the Olympics while representing the country my parents are from. It's a better overall situation." Guyana’s Olympic contingent is just four athletes, so as one might well imagine, Doris was greeted with open arms during his first visit to the country in May. "We had a news conference introducing me to the people on national television," he said. "It was amazing. They were really supportive and happy that I'm in a position I'm in now. I've received a lot of Facebook messages and email from the people of Guyana. The support has been crazy." After spending two years in junior college, Doris won Big Ten championships and earned All-American honors during both the Indoor and Outdoor triple jump seasons in 2011 and again in 2012.